My mom’s Black Bottom Squares were just as I’d remembered them. You may remember back in March, when I posted about Bakerella’s Black Bottom Cupcakes. I talked about how they reminded me of my mom’s Black Bottom brownies that I remembered having a long time ago, and remembered loving. When my mom saw the Bakerella recipe she too, thought it was similar to her Black Bottom squares recipe and she passed that recipe along to me. It took me a while to have a chance to make them, but last weekend I did get that chance. I had never made these squares before, but they were just as I remembered them, dark chocolate and delicious. I prefer them served cold because of the cream cheese. This recipe also made me want to bake some Cream Cheese Swirl or Peanut Butter Swirl Brownies too, so that’s on my list of things to do next. I kept wanting to swirl these as well, but the recipe didn’t say to, so I didn’t do it! Here is the recipe, which my mom put a note on: “from North Kingstown Newcomers Cookbook 1979,” so when I said it reminded me of something I’d had a long time ago, that explains it. These have been around for a while in our family. The recipe is credited to Jean Bolles in the cookbook itself. Today’s recipe will complete my gifts to you for Mother’s Week, just in time for Mother’s Day on Sunday. If you are a mom enjoy, enjoy, enjoy your day on Sunday and if you are lucky enough to be able to spend the day with your mom, be sure to enjoy every minute! Thanks for today’s recipe Mom! 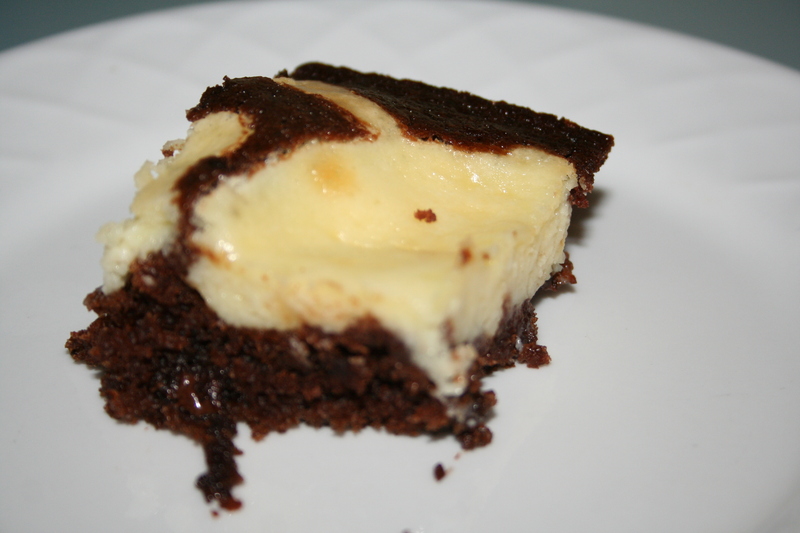 This recipe is completed in two steps: the chocolate layer and the cream cheese layer. Before they bake…this is where I realllllly wanted to swirl that cream cheese, but I did not. Next time though, I might just do it! Combine water, cocoa, oil, vinegar, vanilla, flour, 1 cup sugar, baking soda, and 1/2 tsp. salt. 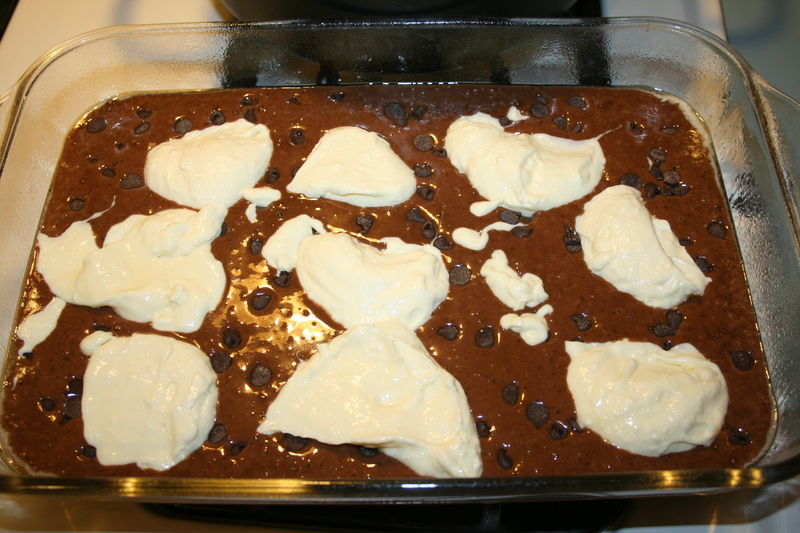 Pour into a well-greased 9×13 inch pan and sprinkle with a six ounce package of chocolate chips. 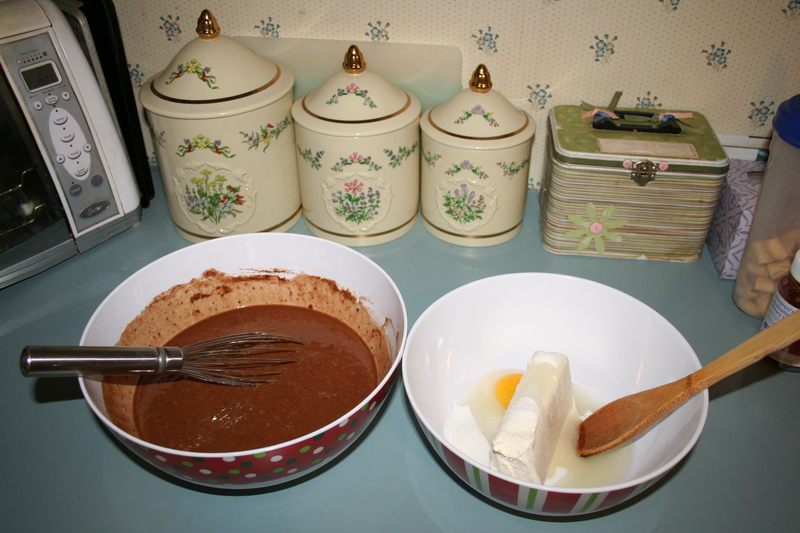 Beat together egg, cream cheese, 1/3 cup sugar and 1/8 tsp. salt. Spoon over chocolate chips and bake at 350 degrees for 30-35 minutes.